It’s back and it’s badder then ever! In an effort to bring our guests the best, we’re adding additional stops and service to bring the best of Rockaway Beach to all the awesome guests from across Manhattan & Brooklyn (coming soon… Queens), to beach with us this summer. After teaming up with the awesome folks at The Bushwick Beach Bus in 2014, we created beach bus VOLTRON that can’t be stopped! This summer we’re taking that collab over the top for the third year of the Rockaway Beach Bus! 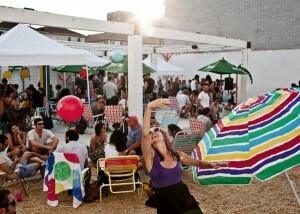 Rockaway Beach is an old New York institution on the rise after surviving the devastating effects of Hurricane Sandy. You can support a rebuilding scene and join OvR on the RBB for an epic day at the beach! Post Hurricane Sandy, the Bushwick staple Pearl’s Social & Billy Club became a major donation drop off hub for supplies in the relief effort. Bar staff and regulars worked tirelessly over the months following the hurricane to bring goods and volunteers to Rockaway. Fast forward to the summer of 2014 and the owners of Pearl’s looking for a way to keep the Rockaway and Bushwick communities connected and flourishing: The Bushwick Beach Bus was born as a direct way to keep Bushwick and The Rockaways connected. 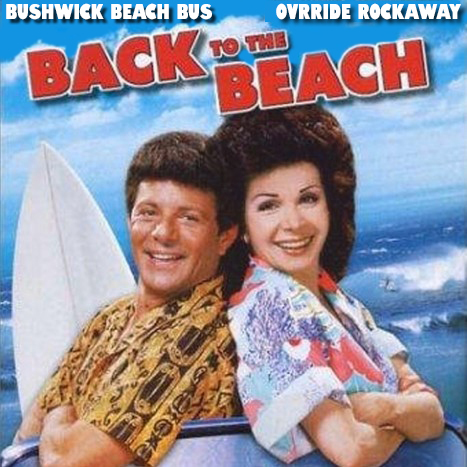 After kicking off the OvR Beach Bus that same year, it became apparent our missions were aligned with the BBB, so we collaborated to bring the best service available from BK to Rockaway for the summer of 2015. It was an instant classic! That’s why we’ve connected all the dots and launched a new incarnation built on the spirit in which it was founded and created The Rockaway Beach Bus! Rent a board and get a surf lesson with the awesome guys at Locals Surf School. Bar hop at some of the best beach bars in the game, or keep it mellow and just hang on the beach, whatever you’re into OvR & BBB have you covered! With exclusive deals at a variety of local spots including restaurants, hotels and shops, you are guaranteed to get the authentic Rockaway experience! Round trip transportation, as well as oneway to/from Rockaway Beach, Riis Park Beach Bazaar and Fort Tilden on “The Fun Bus”. Yes, there will be air conditioning, a bathroom, and refreshing refreshments. Getting to the Rockaways can be (dare I use this bad joke)… No “day at the beach”. When you get on The Rockaway Beach Bus with OvR to and from Rockaway Beach, the commute becomes part of the experience. Kickoff for the OvR / Rockaway Beach Bus is Sunday May 21st and then we’ll be rocking the Rockaways for Memorial Day Weekend Saturday May 27thth through Monday May 29th, then running every weekend with special additional service for holidays and events through Labor Day Weekend! This entry was posted in Events, Featured, Festival, Film, Video, and Media, News, NYC, OvR Shout Outs, OvRcrew, Queens, Summertime, The Beach, Trips. Bookmark the permalink.